Admiral Harry Harris, commander of the United States Pacific Command, arrived in the Philippines on Tuesday for a three-day visit that highlights broad changes to the Southeast Asian nation’s military strategy. The Philippines has lately welcomed the militaries of the US and Japan in order to send a unified signal to China as it asserts its presence in the South China Sea. Though its relationships with the US and Japan have been historically complex, the Philippine government’s current concerns over a newly aggressive China are encouraging it to move past that. China is the most active country that has declared dominion over islands in the South China Sea and reclaimed land by piling dredged sand on top of narrow reefs, but it’s not the only one. Vietnam, Malaysia, Taiwan, and the Philippines have all engaged in this, just to a far lesser degree. As of June, the Chinese had reclaimed more than 2,900 acres of land, according to the US Department of Defense. In comparison, the Philippines had built up only 14 acres. “China has now reclaimed 17 times more land in 20 months than the other claimants combined over the past 40 years, accounting for approximately 95 percent of all reclaimed land in the Spratly Islands,” wrote the Department of Defense in the Asia-Pacific Maritime Security Strategy, which it released last week. Some in the Philippines are wary of Japan because of its occupation of the country during World War II, as well as of the US owing to the Philippine-American War and its Cold War military presence in the region. Despite this, the Philippine government sees the strategic advantage of fostering these partnerships. “The government, recognizing its strategic position, would love to see the US visit regularly — like on a weekly basis,” Hendrix remarked. In exchange, the US can further project its influence toward Asia, which has been the focus of a pivot in foreign policy on the part of the Obama administration. It is a lot like the local convenience store that gives the cops free coffee when they come by. The increased police presence this encourages helps to deter criminals from robbing the place. Even if the storeowner isn’t always on the best terms with the cops on the beat, it’s still better to give away some coffee than it is to get robbed. In April 2014, the US signed an Enhanced Defense Cooperation Agreement (EDCA) with the island nation. The agreement would allow US troops to build facilities and store gear in the country, and to conduct joint training exercises with the Philippine military. Earlier this year, Japanese and Filipino forces began joint military exercises for the first time. Already they have conducted two maritime exercises under the guise of humanitarian assistance and disaster response, but recent talks of establishing a Visiting Forces Agreement (VFA) indicate that this is the beginning of a burgeoning defense relationship between the two Asian countries. The VFA would involve the exchange of military equipment and technology, as well as training and personnel exchanges, said Philippine Defense Secretary Voltaire Gazmin. Talks just started, however, and the Philippines’s last VFA, with Australia, took seven years to become official. But not everyone in the Philippines is so thrilled about the new military cooperation, and both the VFA and EDCA are being legally challenged by local Filipino activists. There is a natural resistance within the Filipino population to a foreign military presence. World War II episodes like the Bataan Death March, in which thousands died when Japan’s military brutally forced 76,000 American and Filipino prisoners of war to walk 66 miles, are still deeply resented by some Filipinos, Hendrix said. Two former Philippine senators spoke out against Japanese military aid in Juneat the press club in Manila. Former Senator Leticia Ramos-Shahani advocated for the creation of a self-supporting military and expressed grave caution about the cooperation with Japan. But Japan has worked hard to rebuild its reputation in the post-WWII era, particularly with initiatives that offer economic assistance as well as disaster relief. The US relationship with the Philippines has also changed in the past few decades. In 1992, after almost a century on the island, the Philippines kicked the US military out of Subic Bay Naval Base in the East China Sea as part of its effort to become militarily self-sufficient. Nevertheless, the US says it still has the Philippines’ back. The Philippine government’s resources have grown strained as it deals with domestic terror attacks by Abu Sayyaf, an al Qaeda-linked militant group. Abu Sayyaf has been taking hostages and is holding at least nine people, according to the government-run Philippines News Agency. 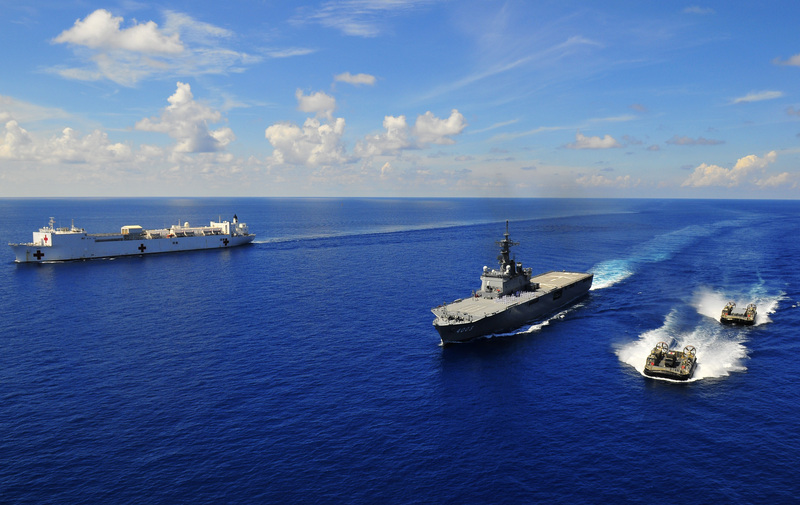 Both Japan and the US have already provided the Philippines with equipment, including deeply discounted ships and planes. In 2011, the US refurbished two Coast Guard Hamilton-class cutters at a cost of $25 million and then gave them to the Philippine Navy free of charge. In 2013, it increased military aid to the Philippines by two-thirds. More recently, in June, Philippine President Benigno Aquino III signed a deal with a Japanese shipbuilder to buy a fleet of 10 patrol vessels. The Japanese government financed the deal with a low-interest $150 million loan. The Philippines’ military relationships are now anchored largely on China’s continuing reclamation and militarization of islands in the South China Sea.